According to the latest Kantar figures covering the 12 weeks ending 19th June 2016, the grocery market continues to grow with sales rising by 2.5% compared with last year, as the average spend per household increased by €27 this year. The surge in sales is mainly due to an increased number of shopping trips (62 visits on average over the past 12 weeks vs. 58 trips last year). However, there has been a return to the trend to shop “little and often” as there’s been a decrease in the number of items per basket. Except Tesco, all of the main retailers increased sales in the past 12 weeks, with Dunnes Stores being the top performer with sales rising by 5.9%. While the grocery market is undoubtedly growing, the landscape remains very competitive and more than ever it’s key to influence shoppers in their choice of supermarket. But how can retailers influence customers? Nielsen has recently shared the results of its latest survey on grocery shopping habits, where it listed the top 10 highly influential factors for customers when choosing a grocery retailer. 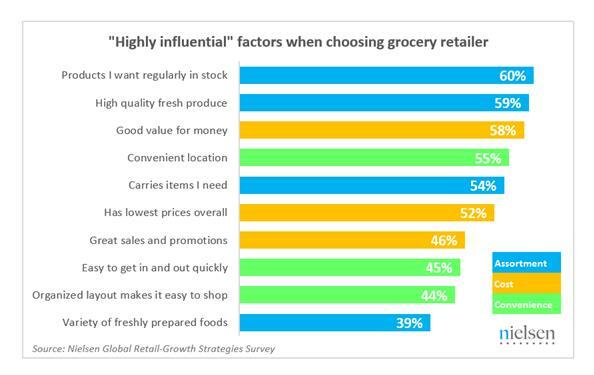 As stated in the study, 60% of Irish shoppers consider product availability as highly influential when deciding which retailer to buy from, narrowly followed by high-quality fresh produce (59%) and good value for money (58%). Contrary to usual belief, having the lowest process ranks just sixth (52%). Four of the 10 most influential factors are related to product range and quality, while three related to each of price and convenience. These findings suggest that Irish consumers are more interested in the right ranges of quality products than pure low prices, which represents good news for grocery retailers as it challenges them to take a broader view about the offering and not be so focused on price. Another important aspect to take into consideration is the convenience factor. “Nearly four-in-10 Irish consumers regard grocery shopping as a chore that they try to spend as little time on as possible, thus, supermarkets need to pay attention to providing a convenient and speedy experience that shoppers crave,” explains Nielsen Ireland’s commercial director, Matt Clark. When choosing a retailer, consumers consider more important how short or fast the checkout lines are (36%) rather than whether they can use a loyalty card there (29%). When influencing shoppers to go to a particular shop, is essential to guarantee the right product range and quality for customers. At CPM we specialise in creating tailored sales strategies to maximise every merchandising opportunity. And with our strategically-led creative solutions, you’ll have a much better chance of standing out in the few seconds it takes a consumer to make the purchasing decision. Contact us today to speak to us about our In-Store Merchandising services.